World political and church leaders including France's Francois Hollande, Russia's Vladimir Putin and the head of the World Council of Churches, Olav Fykse Tveit, in Yerevan have marked 100 years since the start of the Armenian genocide. A minute's silence was held in the Armenian capital, at a ceremony at which Armenian President Serzh Sarkisian and other leaders placed flowers at a hilltop memorial. Many countries recognize that some 1.5 million Armenians died at the hands of Ottoman forces between 1915 and 1917. Turkey, which became a nation following the dissolution of the Ottoman empire, does not recognize the killing the Armenian as genocide and says many Turks died in an Armenian uprising. Two weeks earlier Pope Francis invoked Turkey's wrath by referring to mass killings of Armenians as "the first genocide of the 20th century." Turkey's President Recep Tayyip Erdogan described the Pope's claim as "nonsense" and recalled his ambassador to the Vatican. On the same day as the Aremenian genocide was commemorated thousands of Australians, New Zealanders and Turks gathered on Turkey's Gallipoli peninsula to commemorate the 100th anniversary of one of the bloodiest battles of the First World War. A century ago soldiers from the Australian and New Zealand Army Corps (ANZAC) fought their way ashore on a narrow beach at Gallipoli during an ill-fated campaign that would claim more than 130,000 live. In Yerevan, the World Council of Churches also remembered the 1.5 million Armenian victims who died 100 years ago. "We remember today first of all the 1.5 million victims, Armenian children, women and men," Tveit said in a speech. "We remember also the other hundreds of thousands of Christians of Aramean, Chaldean, Assyrian, Syrian and Greek descent, and all others - many of them from other living faiths such as the Muslim faith - who died in that time of brutal violence and war,"
"We also continue to remember all those who were murdered in the holocaust against the Jewish people, and other genocides thereafter. "The victims were all human beings with their dignity, their families and their hopes, created in the image and the likeness of God. They are never forgotten by God." Representatives from the World Council of Churches joined political and spiritual leaders and representatives from genocide-surviving nations in public commemorations of the Armenian genocide April 22-24 in Yerevan, Armenia. The 10th WCC assembly, the meeting of the church grouping's higest governing body in Busan, in South Korea, in 2013 asked its churches to observe the centenary of the Armenian genocide in appropriate ways. A special Service of Canonization of the Victims of the Armenian Genocide, led by Karekin II, Supreme Patriarch and Catholicos of All Armenians, president of the WCC in the Middle East, and Aram I, Catholicos of the Holy See of Cilicia, took place at the Mother See of Holy Etchmiadzin on April 23. Members of the WCC executive committee participated in the procession, including Archbishop Vicken Aykazian, Armenian Apostolic Church (Mother See of Holy Etchmiadzin), and Archbishop Nareg Alemezian, Armenian Apostolic Church (Holy See of Cilicia). Also present at the service were Tveit; WCC presidents archbishop emeritus Anders Wejryd, Church of Sweden and John X, Patriarch of the Greek Orthodox Church of Antioch and All the East; and many representatives of WCC member churches. 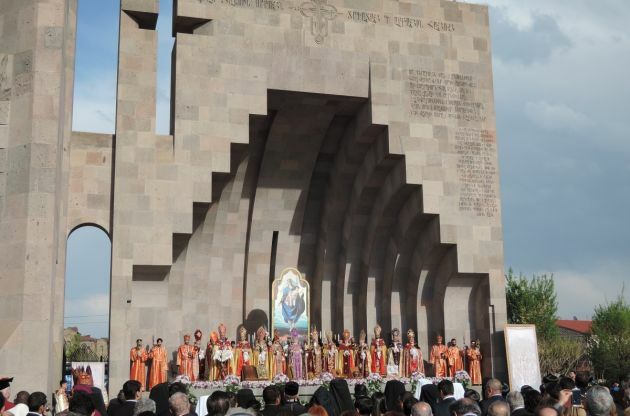 The church bells rang 100 times in virtually all Armenian Churches on the night of April 23 at the end of the ceremony at Holy Etchmiadzin canonizing the victims of the genocide - the first such rite conducted by the Armenian Apostolic Church in 400 years. Many other churches around the world joined the bell-ringing, among them the Notre Dame cathedrals of Paris and Strasbourg, the Cathedral of Christ the Saviour in Moscow, the Buenos Aires cathedral, St. Patrick's Cathedral in New York City, and others. The WCC general secretary was also one of the invited speakers at the Commemoration of the Centennial of the Armenian Genocide in Yerevan, Armenia, on April 23.